Whisk(e)y is produced globally. Whilst Scotland is probably the best known worldwide for it’s Whisky production and heritage it is also produced in Ireland, Wales, England, Canada, America, Japan, India, Australia, New Zealand, Denmark, Holland, Pakistan, Belgium, France, Germany, Austria, Switzerland, Sweden, Finland, Spain, Turkey, South Korea, Thailand, Taiwan, Uruguay, Brazil, Venezuela, and South Africa. Ireland and America call it Whiskey, the rest of the world call it Whisky. This is due to the poor quality of Scotch whisky during the 19th Century. The Irish and American distillers added the 'E' to differentiate their products and avoid the association with the then lower quality Scotch Whisky. The word whisky (or whiskey) is from the Gaelic word uisge meaning water. Distilled alcohol was known in Latin as aqua vitae "water of life". This was translated to Scottish Gaelic uisge beatha "water of life". At Stroud Whisky club we are keen to try as many different Whiskies from all over the world. We mainly focus on Scottish Whisky due to the vast election, high quality and ease of access. Most of what we sample is Single Malt Scotch, blends, Bourbon and Irish Whiskey. Given the diversity of flavours, it’s incredible that single malts are made using only barley, water and yeast. It is through the differences and subtleties in the production process, that these different flavours are achieved. Malt whisky production is not an exact science. There is always an element of magic that happens in the process which means the contents of any two casks are never identical. 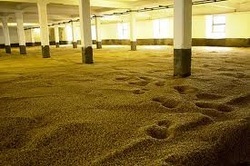 In the first step of the process, the barley is soaked in water and then dried by heating in a kiln. This is known as malting and is designed to make the barley release the starches it contains, but not fully germinate. This stage is a significant factor to the flavour of the end product. In many cases, peat is burned as part of the drying process. This imparts a unique smoky flavour to the whisky. Islay malts are renowned for this and historically this was due to not having mains electricity. "The malted grain is milled and the resultant coarse flour, or grist, is mixed with hot water in the mash tun. This causes the starch in the grains to convert to sugars. The sugary liquid, known as wort (a little like barley water), is then drained off through the sieve-like floor of the mash tun. The wort is cooled and transferred into washbacks . It’s here that yeast is added and fermentation starts. 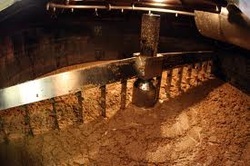 The yeast converts the sugar in the wort into alcohol. After two to four days, fermentation is complete, leaving a liquid called wash that it a little like a strong beer at 8 to 9% volume alcohol. The length of fermentation time has an important effect on the overall flavour of the spirit. For example, a short fermentation time of around two days tends to produce a nutty, spicy, flavour. Longer at four days of fermentation gives time help to create its light spirit, and is one of the factors in delivering a smoother tasting whisky as well as fruity flavours. After fermentation, the wash arrives in the still room, ready for distillation. Scotch whisky is typically distilled twice in copper stills. You might think of the still as a big kettle with a fire underneath it. The size, shape and number of stills have a big influence on the taste of the whisky, due to the spirit’s interaction with the copper. Generally, the more the spirit interacts with the copper in the still, the lighter the spirit. The first distillation happens in the larger wash still, where the wash is gradually heated until the alcohol turns to vapour. A condenser transforms that vapour into a liquid known as low wines with an alcoholic strength of around 20%. The low wines are heated again in a spirit still, which is a smaller version of the wash still. It vaporises and condenses again and the liquid, now at around 68% alcohol, flows through into the spirit safe. The final part of the process is to transfer the new-make spirit into oak casks. 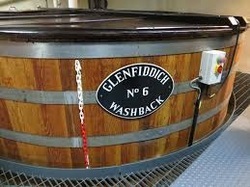 The maturation is crucial in influencing the final character of a Single Malt Scotch Whisky. The oak casks remove some of the harsher tastes of the new make spirit and, at the same time, expose the spirit to a variety of flavours and aromas derived from the interaction with the wood. 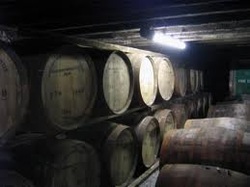 Casks are either American oak, which previously held bourbon or European oak, which previously held sherry. The choice of American or European oak casks provides different colours & flavours. European oak tends to produce sweet & fruity notes and a darker coloured spirit. American oak tends to produce sweet vanilla notes, coconut notes and a lighter colour After three years in the cask, the spirit is legally allowed to be called Scotch whisky. This is a trend which is becoming more popular. Finishing (also known as “double matured” or “wood-finished”) is the procedure that some single malt Scotch whisky (and other whisky) undergoes whereby the spirit is matured in a cask of a particular origin and then spends time in a cask of different origin (generally 6 months to 2 years.) Typically, the first cask is an American oak cask formerly used to mature bourbon. 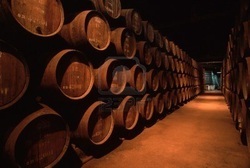 The second cask is usually one that has been used to mature some sort of fortified wine, often sherry, though sometimes port, madeira, or even standard wines such as burgundy or chardonnay. 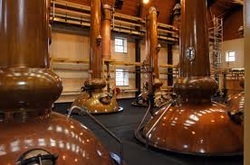 Some of the more well-known finished whiskies include Balvenie "Doublewood", which is finished in sherry casks, Glenlivet "American Oak Finish" and "French Oak Finish", which are finished in brand-new casks of the respective woods, the Glenmorangie range of sherry, port, madeira, and burgundy finishes, and the Diageo line of "Distiller’s Editions", a "Double Matured" expression of each of their classics line of single malt scotch whiskies (Cragganmore, Dalwhinnie, Glenkinchie, Lagavulin, Oban, and Talisker.) Diageo has others, such as their Maple finished Crown Royal expression. Want to see what events are on? Check out our EVENTS page!